Text Â© Shane O’Toole. 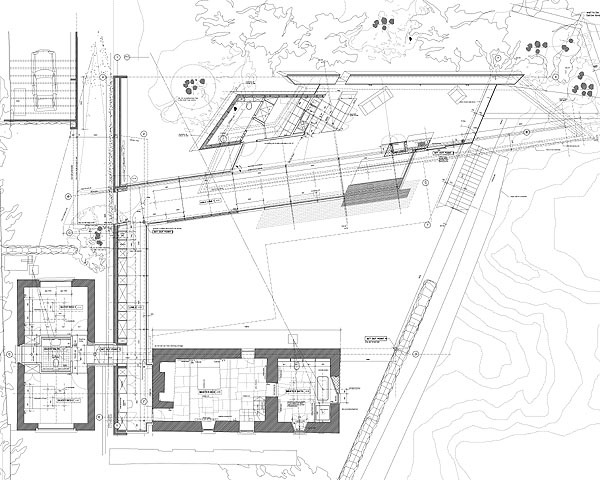 Plans and both aerial photos Â© Niall McLaughlin Architects. All other photos Â© Nick Kane. Fuller version of the piece first published in The Sunday Times, February 13, 2005, as “Trapping the light fantastic”. Speaking to a packed hall of rapt architects in his hometown of Dublin two years ago, Niall McLaughlin surprisingly classified the small-scale designs with which he had made his international reputation as “trial pieces”. 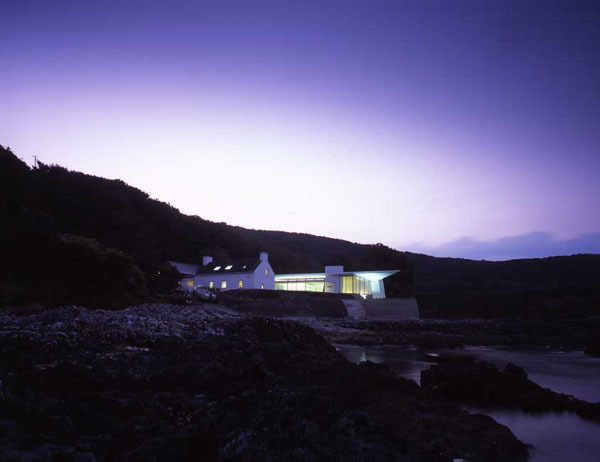 The phrase captured the experimental ethos of the former young British architect of the year precisely (he has used a wide range of materials, from gold to Daz washing powder, in his building projects) but it bore no relation to the perfectly tilted notions of beauty that seemed to imbue every project that emerged from his studio. They include a tiny chapel and cloister in the Carmelite monastery in Kensington, west London, that has been called one of Britain’s modern wonders; a photographer’s hide on a pond in Northamptonshire shaped like a mechanical alien water bug; and a jolly seaside bandstand that took three years to design and resembles a rippled megaphone or abstracted sea gull, its two wings hovering over the performers and projecting sound towards the audience. “My first decade in practice was an apprenticeship,” said McLaughlin, “a way of finding a voice.” He spoke of having enjoyed a second education after setting up office in London, teaching at Oxford and the Bartlett, University College London. As a student in University College Dublin he had “absorbed the cannon of architecture as a pure discipline, a pure art,” whereas at the Bartlett they “frown on looking at other work and prefer the pursuit of innovation through ignorance,” he said. “They allow that architecture can fuse with other arts.” McLaughlin’s unique architectural voice owes something to both cities. 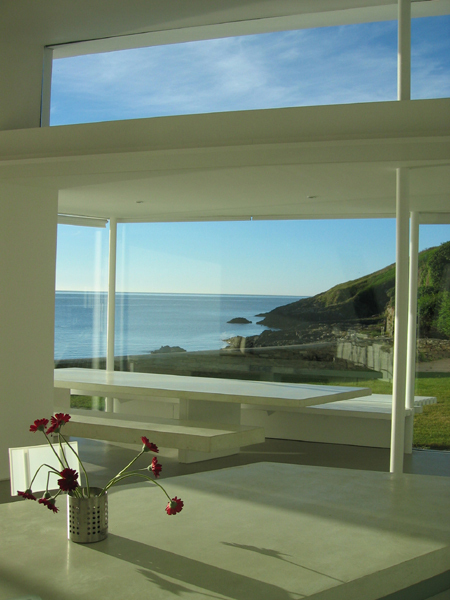 The influence of his Dublin training, with its devotion to architectural precedent and reference, is evident in a house he completed near Clonakilty, County Cork, last year – his first free-standing building in Ireland. 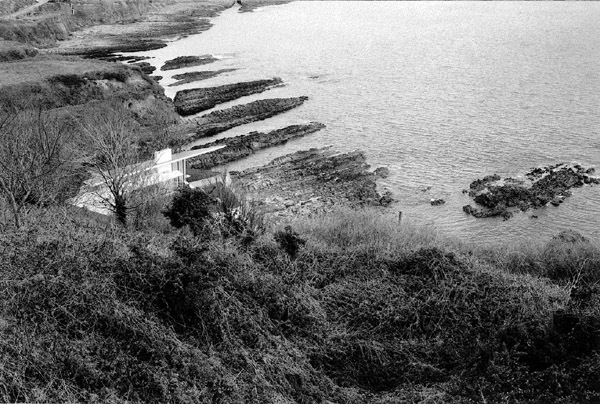 Dirk Cove is a small harbour that faces southeast across Dirk Bay, sheltered by Dundeady headland. There was a boat slip on the wedge-shaped site and some old stone buildings that were once a coastguard’s station. The solid coastguard structures were refurbished to provide three bedrooms – the owners in the cottage and guests in the boathouse. An airy, timber-frame extension containing the living spaces was placed on the far side of the promontory, set against a thicket of mature trees and pushed out towards the sea, its canopy soaring over the shore. 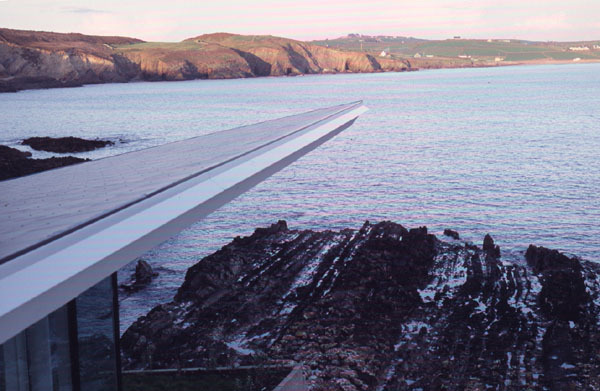 From the hilltop above, the extension connects metaphorically with the site’s geological grain – the long fingers or shards of rock stretching out into the sea beneath the cliffs. The planes at the extremities of the extension are tilted and skewed, as if straining to catch the last rays of the setting sun. McLaughlin insists it was not done for effect. And when you sit in the house at this time of year, the low sun seems to track along the shadowing hill during the afternoon, staying above the ridge line and illuminating the interior. The house is almost invisible from the road that skirts the bay. The final approach is dark and ferny. A vernacular, black slate wall frames the entrance. “We wanted to build the house from materials you could buy in the local hardware store, but apply technology to it,” he says. The slated roof, which cantilevers 8m, is of steel, ply and fibreglass and was built by the Australian who formed McLaughlin’s bandstand at the De La Warr Pavilion on England’s south coast. Crossing the threshold, you are pulled left, towards the light and the sea – which you last saw from the road above – into the living space. 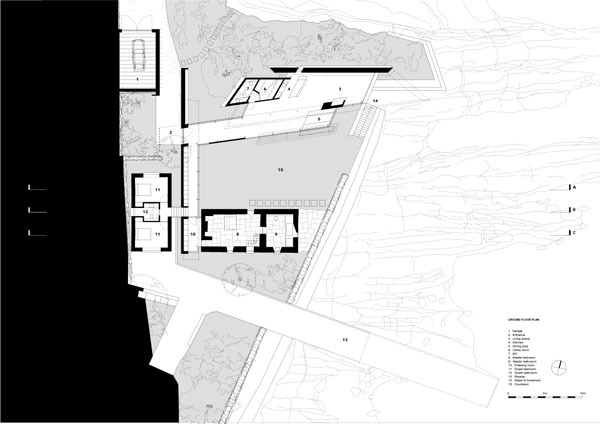 A long glassy link between the parts of the house forms an edge to a kind of sheltered cloister garden open to the water. You cannot see it yet, but beyond the chimney, which closes the cloister, the view opens to the horizon. McLaughlin had just returned from visiting Erik Bryggman’s 1940 Resurrection chapel in Turku, Finland – with its flared nave and light penetrating low from a glassy aisle to one side – when he set about designing this transcendent sequence of spaces sliding past each other. “Shane de Blacam and Robin Walker, my teachers, had a reverence for the inner spirit of materials,” he says. “I would tend to be more promiscuous in the way I think about them.” He demonstrates the point in his recent block of 12 flats in London’s Docklands for the Peabody Trust: “You can make connections between materials and history and ideas,” he says. McLaughlin regularly collaborates with the artist Martin Richman – one-time stage and lighting designer for Jimi Hendrix, the Velvet Underground and Pink Floyd – because, as he says, “I wouldn’t produce much original work if I was left all to myself. Martin’s been an official member of the office since we worked together on a blind date for an exhibition at the RIBA in 1997.” Their approach to low-cost housing in Silvertown was to accept the economic logic of simple forms made from speedy timber-frame construction. “I went to the interview with a UPS box wrapped in brown paper, colour-coded tapes and bubble wrap,” says McLaughlin. 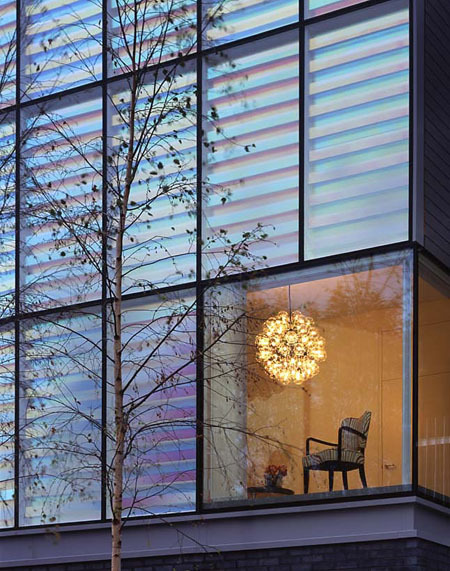 “The key idea was about industrial wrapping, but we had no idea of how to do it at that time.” Wanting to connect with the area’s “cheap, chemical history,” they eventually developed a system that uses ribbons of radiant light film to create a “chemical flare” across the building’s façade. Radiant light film, produced by 3M for use in packaging, ribbons and shoes, is dichroic. It is iridescent like a peacock’s feathers or petrol on water. 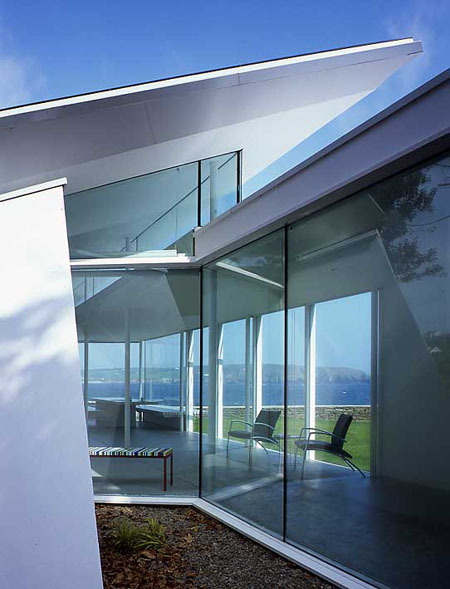 Never previously used in construction, the architects encased the material in modified double glazing units – one face is cast glass, the other aluminium – manufactured by Architectural Aluminium in Dublin. They attached strips of film to slats of glass, set alternately forward and back in the cavity, so they appear to reflect different spectrums. The spirit that animates McLaughlin’s shimmering invention seems more Dutch – and therefore more modern – than British or Irish. “Its limitation is that the effect is only skin deep,” he says. He is looking for something deeper. Houseboat, his recent winning design for a home of the future is, he says: “One of a number of projects that explore an intuition about a certain sort of architecture, without necessarily yet having the means to make it.” A floating structure with woven walls of carbon fibre, where nothing is hidden away and storage is flown like a stage set, it looks like a cross between a Heath Robinson contraption and one of Paul Klee’s twittering machines. A descendent of Archigram’s influential 1960s ideas, Houseboat is conceived as a metabolism that can process its environment, a body with a self-correcting ecosystem that is half nature and half microchip, romantically blurring the boundary between nature and machine. McLaughlin says projects like this “provide a store of ideas or possible worlds you can use.” It will be interesting to watch him pick off pieces from the matrix and test them for real over the next few years.